Like all cities on the silk route, Tbilisi has a history to tell and plenty of stories to get inspiration from. Stories of kings and queens and poets like Rustavelli. Aleksandr Pushkin imagined some of his ‘hot stories’ whilst he was resting and healing in the city’s Abanotubani sulfur baths which drew many more artists to the place. Georgia was also the cradle of winemaking, a long time before the nations around the Mediterranean started cultivating their vineyards. Georgia is located at the crossroads of Eastern Europe and Central Asia. A non-visa destination for most EU states, Georgia is a short direct flight from most major European capitals. Packed full of stunning landscapes, mountain villages, ancient churches and several of Europe’s tallest peaks, there is something here for all meeting and incentive guests. My exploration of the capital city Tbilisi started in the historical old quarter of Metekhi. From this elevated cliff beside the impressive Metekhi Church of Assumption, there is a fabulous panorama of the Mtkvari River and the old town. From here you can see how wonderfully well the city has mixed its ancient past with its contemporary architecture. From this viewpoint, you can see the boats gliding on the meandering river below. 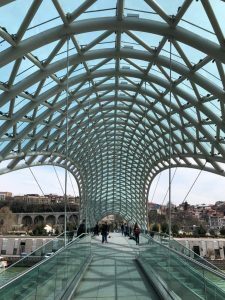 Spanning the river, one can see a contemporary bridge in the form of a green structure which resembles the skeleton of a dinosaur; yet built of glass and steel. In the historic district, one finds wonderful souvenirs of enamelled silver accessories as well as other Georgian handicrafts. Some great ideas here for authentic and locally sourced room gifts for your conference. But this area is not only for shopping and visiting museums. At the junction of Bambis Rigi and Shardeni, streets are filled with cafés and restaurants and invite for outdoor entertainment. And Georgians can dance, as groups like Grup Berikaoba like to show off their skills and impress and inspire onlookers by their joy of dancing. Georgia is truly full of cultural and ethnic richness. 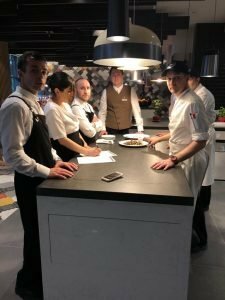 One way a culture can show its quality and uniqueness is via a food experience. 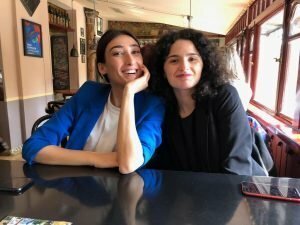 I already knew about the Georgian food culture after my trips to Moscow and St Petersburg where many Georgians have created their own little culinarian heavens. 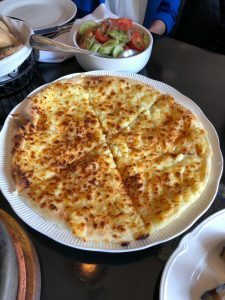 Khachapuri (as of course everyone knows is the national dish) and vegetarians have a ball when eating in Georgia because fresh vegetables are available in abundance and the creativity of the Georgian cuisine makes them taste good as well. Walnuts and coriander are widely used in addition to fruits such as pomegranate and quince. Delicious meals are eaten with a delicate plum sauce. A totally different part of town houses the magnificent and solid buildings on Freedom Square and Rustaveli Street; this includes the parliament, the Opera House, the National Gallery & the Rustavelli Theater. The area is home to lots of cafés, restaurants and shops; a welcoming haven for outdoor living and some serious ‘retail therapy’. Museums like the National Gallery are full of art like the works by Pirosmani from the 20s and 30s which became world famous whilst the artist could barely survive and was paid in paint or bread. 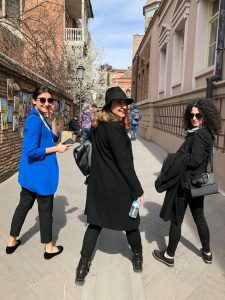 There are still workshops in town where one can get an introduction to Georgian painting techniques; a great activity for a true Tbilisi immersion programme on the side of a conference, meeting or incentive programme. Time for lunch now! And no better place in this part of town than the famous and picturesque Café Gabriadze. The monumental clock tower of the Gabriadze Puppet. Theatre resembles a fine work of art whilst the famous playwright artist decorated the interior himself. For me, the first Georgian experience had started with a late night check-in of the Rooms + Stamba Hotel design hotels. This fabulous twin-hotel is housed within historic atriums, passages and courtyards of what was once Georgia’s most important printing house. The unique design of Stamba Hotel was conceived to highlight the industrial splendour of the 20th century the publishing house in which it is situated. The brutalist a framework is shot through with nostalgic references to the roaring ’20s and glamorous ’30s, while fresh new touches lend the hotel a distinctly contemporary edge. 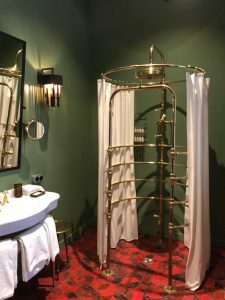 Original features have been imaginatively restored, contributing to the hotel’s overarching sensorial experience, which in turn offers an expressive journey through both the vintage and the modern. The former publisher’s print drying beam now runs through the trees and foliage that dominate the hotel’s green, five-story atrium. The hotel is an ever-evolving identity as a hotbed of talent and authenticity. And the rooms, they are large and simply fabulous, spacious as well as truly unique and vintage. Time for some serious venue sourcing! Tbilisi has an extensive collection of exquisite hotel and conference capability that serves our meetings and incentives for clients. 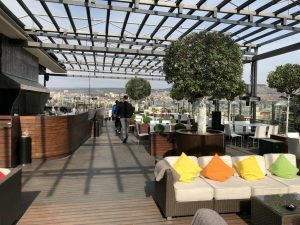 Only a few people know about it in though… Our first visit of the afternoon was the contemporary Iota Hotel, ideal for smaller meetings and events and built in a very nice architectural style with an open-air rooftop restaurant (or) event space with nice views over the city. The hotel boasts a beautiful wine cellar which can be used for tastings or dining up to 60 people. From here we went back to the main boulevard to visit the luxury Biltmore. No, not the Los Angeles one, this one is the Tbilisi Biltmore. The main lobby and events space of this hotel occupies the former Soviet regional parliament building which was transformed by its Emirati owner into a luxury hotel. 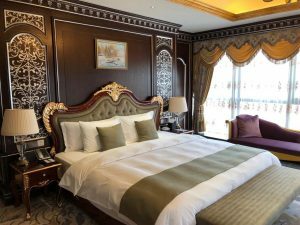 Whilst the old part of the hotel is in a classic style, the rooms are set in a new and imposing hotel block towering over this part of the city. One gets a great view from the rooftop restaurant on the 32nd floor. Impressive are the conference facilities and the transformation of the former parliament half round auditorium into their main conference room called The Guild. We walked to the adjacent and beautiful Radisson Blu Iveria. In grand and modern Radisson style the hotel has extensive meetings and conference facilities and can easily host a small conference under one roof. On the other side of the road, the company running the Radisson also purchased an important building (Republic) that houses even more banqueting space. Republic is a multifunctional event space hosting 3 different venues ranging from several modern event spaces to an upscale gourmet Seafood restaurant with a rooftop terrace. The hotel has several restaurants of which the Asian one claims to be the best in the country. For our next visit, we drove to the outskirts of the city to visit a very surprising property. Hotels and Preference Hualing is a somewhat complicated name for an exclusive property, built by a Chinese investor and real estate mogul who owns all the land around as well. Everything in this hotel is massive and spacious and has a true luxury Chinese touch to it. Conference space wise it is the second largest hotel in town after the Sheraton. The hotel is not located in a business zone so their business is entirely focused on meetings and events. If you want to do a hotel buy out for a major meeting, this is it! And as with the other hotels described before, there is no hotel classification in Georgia so every hotel can be considered a four star which is good for the healthcare meetings segment. 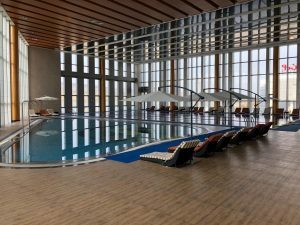 The Sheraton Grand Tbilisi re-opened after a complete renovation and capacity extension only a few weeks ago. No other hotel can offer as much state of the art conference and ballroom space including multiple breaks out, banqueting and board rooms than this hotel. The hotel is built around an imposing modern atrium from which access is easy to the convention centre, the restaurants and the Club Lounge. 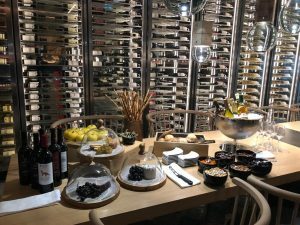 As every self-respecting hotel in Georgia, it has an impressive wine bar for tastings and dinners as well. Other hotels that cater for the meetings and events market and which I would like to mention include the Holiday Inn, the Crowne Plaza Borjomi, the Marriott Hotel Tbilisi, the Best Western Tbilisi, the Lopota Lake Resort & Spa, the Marco Polo Hotel Gudauri and the Tskaltubo Spa Resort. Before returning into town, Keta & Ani just wanted to show me a large capacity banqueting venue which is used for weddings and parties but of course, caters to visiting conference and events guests as well. 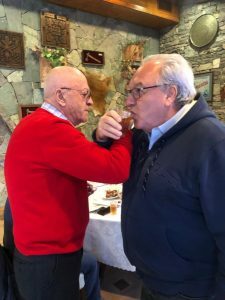 This is when serendipity happened… We were welcomed at the venue by 72-year-old Guja Bubuteishvili who surprised me to a traditional Georgian Supra (the Georgian version of an afternoon tea) with his friends and acted as the Tamada, or toastmaster. I did not understand a word of what was being said but it was apparent that the guy liked us. This ‘ceremony’ took about one hour of toasting to all the goodnesses of the people of Belgium and Georgia, our friends and family and our businesses. After each toast, glasses of Qvevri were raised, we hugged and kissed each other, crossed our arms and downed the glasses of wine in one go. As this became a bit boring after a while, the wine was replaced by vodka, chacha or cognac. Luckily there was plenty of food, sweets and nuts on the table so it did not have to fall on an empty stomach. We narrowly escaped this great Georgian hospitality as we still had to tour the venue but my new friend Guja caught up with us in his restaurant for a sing-along of traditional songs. And so a star was born. I had to call it an early night after this experience! 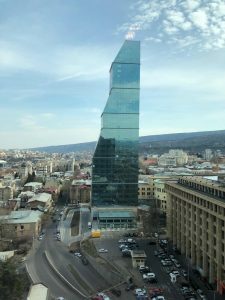 My official host for this visit to Tbilisi was the Georgian Convention bureau who had asked me to run a Meetings Industry Master class for their members whilst I was in town. About 40 hoteliers, DMOs and DMCs attended my class on the opportunities on the European market for their industry. Up to now, most business either comes down out of Russia or up from the Gulf region. But new access routes by major airlines and the construction of new hotels have now created new opportunities for the destination. Understanding the requirements and opportunities from the European as well as Asian markets is very important for this community. Now that Georgia has risen up to this wild card status, I’m curious to see how this develops and grows through our partnership with one of the leading DMC companies BTL. With its geographical location in the Caucasus, the country has an abundance of agricultural produce. On street corners everywhere you can find old women selling freshly picked tomatoes, cucumbers, bell peppers and pomegranates. I was able to sample some of the great foods and national dishes throughout my stay. 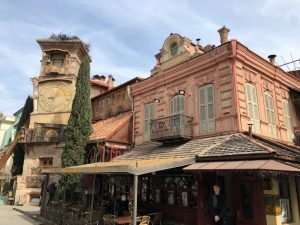 At restaurants like the Gabriadze Café, the carefully hidden and intimate Keto & Kote or the Funicular Panoramic restaurant which Fidel Castro liked a lot. A typical meal consists of a fresh salad as a starter, consisting of gorgeous tomatoes, cucumber and bell peppers with sunflower oil and very often accompanied with some home baked bread. Then the national dish of Khachapuri ca come in many shapes and formats, mostly with fresh farmers’ goat cheese and plum sauce. This may come in the form of a pizza, in a role stuffed with cheese or other stuffing or a multi-layered one that included nuts and plums. And then there is wine! Plenty of wine. Not known enough yet in Western Europe though but a wine of high quality and low price. 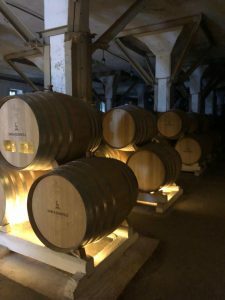 Originally they started putting wine in amphorae rather than oak barrels. The well-known fresh, dry yellowish Qvevry wine is still made this way. In Georgia, you are in the cradle of winemaking. This is where it all started. Grapevine has been cultivated in the fertile valleys of Georgia for about 8,000 years so it’s no wonder guests travel from far and wide to enjoy and sample the 500+ varieties of endemic grapes cultivated here. The strength of our Ovation Global DMC brand is that we have a local champion in every destination where we do not own a fully owned destination services office. In over 70 destinations in the world, we have this and for the Ukraine and Georgia, that partner is BTL. 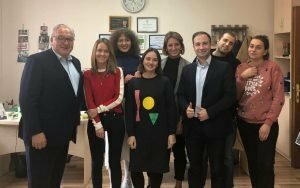 Guram Kochiashvili and his team welcomed me at their office for some talks about the development of this ‘wildcard destination’ and share some thoughts about future activities and strategies. Georgia offers plenty of outdoor activities for incentive trips. Take a helicopter tour around the beautiful Stepantsminda and feel the spirit of the Caucasus Mountains. Or go paragliding, rafting, horse-back riding or take a jeep tour. 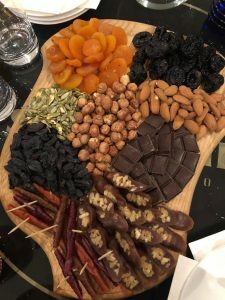 For the more adventurous ones, you can take part in cooking traditional Georgian dishes and sweets. Self-Drive Jeep Tours are also a favourite in the Caucasus mountains; day and night rafting; balloon flights and in the winter; Heli-ski or snowboarding; hiking in the mountains; speleo tours, corporate golf tournament, etc. For groups who are looking for team-building activities, we suggest Georgian National Ballet Master Classes; Master classes in Georgian Cuisine (cooking the national dishes Khinkali, Khachapuri, Churchkhela); participating in the grape harvesting in September / October and creating your own wine brand with the traditional methodology of Georgian winemaking. Kvevri tasting masterclasses; traditional Georgian Supra experiences with Tamada (toastmaster) and all the customs/traditions with it are part of nearly every programme. A famous quote sounds like this: “What we give makes us richer, and what is hoarded is lost” That pretty much sums up these past two days indeed! On one side sharing knowledge and best practice with the people in an emerging meeting and incentive destination for the better of our profession as well as the true hospitality and friendship that was shared in return.